Cook Quinoa as directed on package, set aside in medium mixing bowl. In a medium size skillet, sauté onions and garlic on medium-high heat in olive oil for 1-2 minutes. Add shrimp and cook 2 minutes and stir while cooking. Shrimp will not be cooked all the way. Mix shrimp, pizza sauce, parmesan cheese and basil into the quinoa mixture. Season with salt and pepper to taste. Pre-heat oven to 350 degrees, spray a 9 x 13 pan with non-stick cooking spray. Fill each side of the peppers with ~ 1 cup of quinoa mixture and set with quinoa side up into the baking pan, top with 2 Tbsp. of mozzarella cheese per pepper. 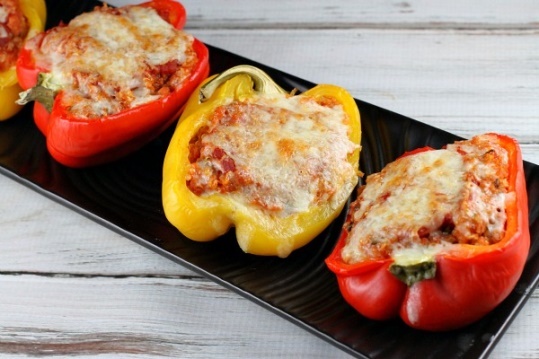 Bake for 25 minutes until cheese is slightly brown and peppers are soft but still slightly firm. Enjoy!